Knowing how to effectively take notes in high school is necessary for interpreting, organising, summarising and memorising information. Typically high school students will need to use notetaking for listening to lectures given by teachers, summarising class notes, homework, reading and researching from books and the internet. Most importantly, you should create summarised study notes based on syllabus dot points. These should be regularly revised, especially leading up to your exams. 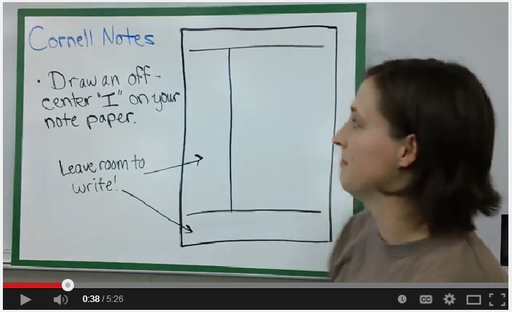 Effective notetaking is essential to help students to retain information. Having good notes will play a very important role in your final results. Get used to creating your notes using a method that best suits you. - Whatever method you prefer remember to record the bibliographic details of the information source for ﻿referencing ﻿purposes and keep with your notes. Paraphrasing skills are also important to help you summarise information into your own words. On the right side is the note-taking column. This is where you write brief summarised notes. This is probably the most important part of taking notes! After taking notes, it is important to re-read and review the information on a regular basis (every couple of days). When reading the notes, it is a good idea to highlight or underline important ideas and add any details that might have been missed. (If you add information to your notes, make sure it is accurate). 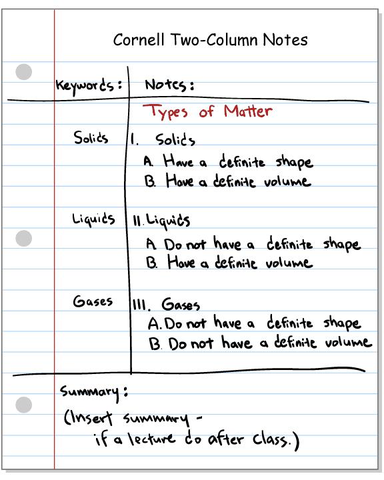 The notes are a great study guide for tests, quizzes and assignments.